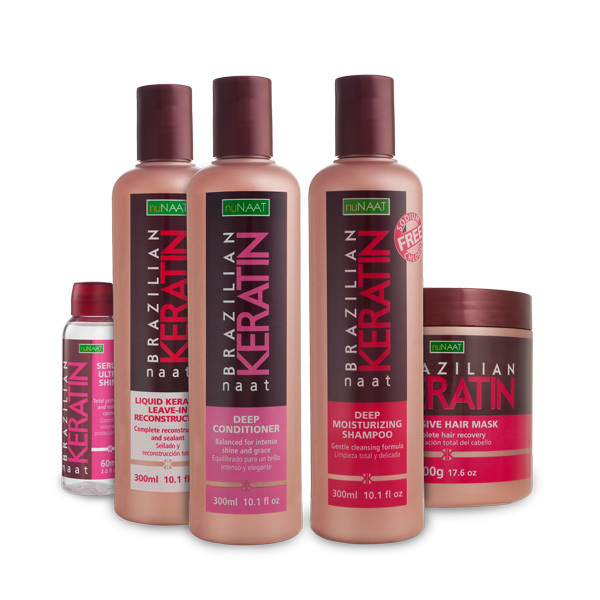 For the past couple of weeks I've been using nuNAAT Brazilian Keratin hair products. I have a normal to dry scalp and like to wash my hair every other day right now. I've been having lots of trouble with flyaways and frizz. I have never colored my hair or used any type of chemicals on it (not since childhood anyhow). My hair is pretty much "virgin" hair but it still has it's problem days. The first NAAT product that I used was the deep moisturizing shampoo. I read the back of the bottle and noticed that this is sodium chloride free and contains green keratin. The bottle is a nice easy to hold size at 10.1 fl oz. The smell is really mild and slightly sweet to me, maybe floral. The shampoo has a really nice viscosity to it. It's easy to lather up between my hands before applying it to the hair without losing some to my shower floor. The lather was amazing and really bubbled up if you like that sort of thing. The shampoo penetrated every single strand of my hair and washed it clean without removing all of the natural oils. The shampoo rinsed out easily and left my hair brilliantly clean but it felt moisturized. The second NAAT item that I tried out was the deep conditioner. The smell was similar to the shampoo but stronger. This conditioner also has a nice thick viscosity and it holds onto the hair well. I left it on for about 5 minutes while I shaved my legs and then rinsed. The conditioner took a bit of effort to rinse out. I think my hair still felt like some product held onto it afterwards, it still felt a bit slippery. The hair did feel extremely soft afterwards and I had absolutely no troubles combing through it. The conditioner acted like a detangler in addition to the amazing moisturization. When I dried my hair it didn't feel weighted down in the least. My hair felt soft, tamed and sleek. My third and fourth NAAT experience was with the intensive hair mask and liquid keratin. I had some extra time one night because I put the kids to bed a bit early. I decided to make it a pampering evening of nails, hair and a facial. I took a handful of the hair mask and massaged it all over my head. After making sure every bit of my hair and scalp was covered I twisted it lightly and clipped it up. I took a plastic shower cap and covered my hair. I think I left the mask on for about 15-20 minutes. This product does not smell quite as strongly as the shampoo or conditioner. After rising that out for about 10 minutes I towel dried my hair very lightly. Before blow drying I rubbed a bit of the NAAT liquid keratin leave-in reconstructor into my hair. This leave-in has a light smell just like the shampoo and conditioner but I don't smell it much after styling. I was really surprised that it was just liquid. I found it hard to squeeze into my hand without it making a little mess. If it could be thickened somehow I think I would prefer it more but I still love its performance. I let that soak in for about 5 minutes and then finished my blow out. When I blow dry I like to separate my hair into three sections. I start with the bottom layer and move my way up going from root to tip using a flat 3" brush. I make sure to blow dry my hair to 90% dry before moving on to my flat iron. This brings me to the fifth and final NAAT Brazillian Collection product, the keratin serum ultra shine. Before using my flat iron I take a dime sized drop of the serum and rub it between my fingers to heat it up. I rub that all through my hair from about 3 inches away from the scalp on down to the tips. After I finish up with my flat iron (I use a 1" KQC Turbo 2 model and love it!) then I take an even smaller drop of the serum and rub that between my palms. I use my palms to smooth any fly away hairs down. The serum smells like nothing to me and it makes my hair super sleek and shiny. I love this stuff and sometimes carry it in my purse for any hair emergencies. Below is my hair after using all five products with a fresh hair cut. I felt like a million bucks, it really made my hair shiny and smooth. My hair has a vibrant bounce to it and unlike typical animal-based keratin, NAAT's exclusive green keratin formula stays in your hair longer and is more resistant to rinsing so you know it is staying in there, making your hair look even better wash after wash. These are excellent for every day use. The NAAT products are worth every penny in my opinion, I highly recommend them to anybody.